Alternative title : "Pure Love", "Crush on You"
KIM Yun-woo works as a low level civil servant in a district office. Although he is thirty, he is still quite innocent for his age and has been on numerous unfruitful blind dates in search of a suitable wife. After moving to a new place, he often runs into HAN Soo-young, a high school student who lives downstairs. 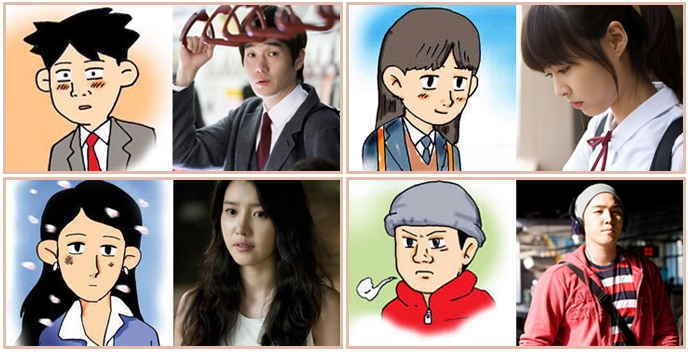 HAN Soo-young is a cheerful and eccentric eighteen-year-old who lives with her mother that acts like a princess. Meanwhile, KANG Sook has just started to work at the district office straight after graduating from high school and falls head over heels for KWON Ha-kyung, a melancholic woman who always smokes in the same spot, because of her beautiful smile. Ha-kyung is still holding onto an old flame and keeps on looking for traces of that love every day. KANG Sook continues to keep wooing her, irregardless of her living in the past. Can their futures lead to a happy ending? Lee Yeon-hee becomes Jo In-sung's lover in "Kwon Bob"
Among the various factors that constitute human life, culture has the greatest capacity to nurture connections and exchange. One culture quickly absorbs the advantages of another culture and develops to integrate naturally into a large wave. A festival of Korean manhwas, decorating L.A.
Korean comic books, re-emerging as a popular form of cultural content, are now targeting the European market. [ChanMi's movie news] 'Speedy Scandal' tops the charts! [ChanMi's movie news] Chae Jung-an Kangin, 10 hours of kissing for one scene! View all 52 pictures for "Hello Schoolgirl"